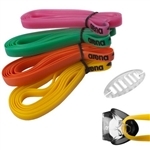 The arena Strap Kit features multicoloured head bands for racing goggles. The silicone straps provide stable, less elastic fit and customized design of the goggles. The included stopper ensures easy attachment and ajustment. Goggles not included. 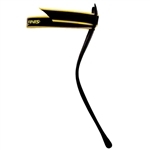 Replace worn or broken goggle straps with the universal goggle strap from Speedo. This silicone tube strap with barrel adjustability works with all Speedo goggles. Simple clip keeps headbands knot free! Designed for Swedish & Italian style headbands (sold separately) Will also work with bungee headband straps. White headband clips. Designed to fit most straps. Sold in Pairs. Strong, durable bungee cord fits any goggle. Barrel clip holds ends together. Goggle not included. The Drag+Fly™ adjustable swim chute offers the latest in resistance training technology. The Drag+Fly™ is sleek, versatile and durable, designed to maximize the power of resistance training for every fitness goal. With the advanced Resistance Zip System, users can easily adjust the level of intensity to take strength and endurance training to the next level. Designed specifically for breaststroke, the Kick Pro limits the range of motion to activate outer leg muscles and engage the core, resulting in a faster, more efficient kick. The Posture Trainer promotes correct head and spine alignment, which is key to an efficient swim stroke. This amazing tool to help you learn to kick properly, with more power, efficiency, and speed, all while creating less drag. Introducing the Speedo Dragtini, a distance-friendly swim resistance parachute. Ideal for training longer sets with moderate resistance. Ultra-absorbent sports and leisure towel made from microfibre. Removes water and sweat with just one wipe and can be reused immediately after wringing out. This light and practical towel is essential kit. Universal-fitting headstrap features VTS (Varied Tensile Strength) with round-to-flat design. Offers Glide Clip System for easy, on-head adjustment. The Tech Toc improves hip movements with audible feedback. Great training video available here. The fin placement on each hip creates resistance which forces the swimmer to rotate their hips at the top of the stroke when the greatest amount of core strength occurs. Helps build upper strength by eliminating kicking. Floats in pool or hot tub. Dual markings (Farenheit & Celsius). Replacement strap for your Aqua Sphere eyewear. The strap for the Adult Seal & Seal 2.0 masks has a width of 17mm. The Kaiman, Kayenne, Vista, Eagle & SealKid replacement strap has a width of 12mm. 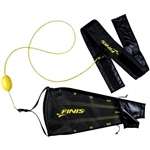 The Swim Parachute is made up of a comfortable, adjustable nylon belt, which is connected to a durable parachute. 1/8" replacement silicone double head strap for goggles. Include replacement back clip. Resistance workouts are a vital aspect of swim training and conditioning. The Dryland Cords are made with durable rubber tubing and comfortable handles. Three Resistance Levels: Yellow Webbing - Light Resistance, Green Webbing- Medium Resistance, Red Webbing- Heavy Resistance. Elevate resistance training with the Ultimate Drag Suit. This universal fit drag suit is designed with drag cups integrated into the suit, which increases resistance while swimming. Super absorbent swimmers towel. Absorbs many times its weight in water. Great for all water sports and eliminates the need for heavy wet towels after workouts. Taped cleat opening increasing durability. Thick, shaped neoprene hugs your shoe and protects you from the wind and water.